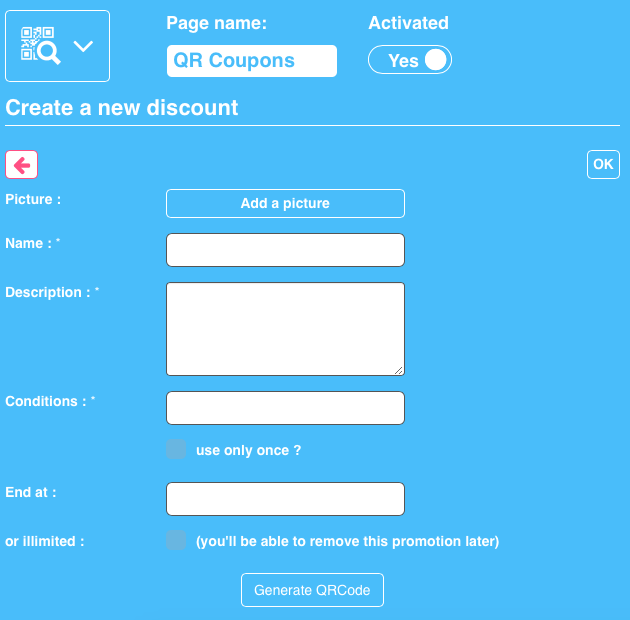 This feature will allow you to create discount coupons that will be unlocked by scanning a specific QR Code. Once unlocked, the customer can use the discount when he wants. That means the coupon will not appear in the app for the user until he has scanned the QR Code (When you will add a coupon code you will not see it until you’ve scanned the QR code). As a business owner you create a QR coupon, and you obtain a QR Code. You can distribute this QR code on your website or in a newsletter, etc to reward specific actions, or just show it to premium clients so that they can flash it. Once scanned the coupon will appear in their apps. To add it to your app, just click on from “Add pages”. Then let’s create a QR Coupon.